German Park is located on Pontiac Trail- an old Indian trail that runs between Ann Arbor and South Lyon, Michigan. New visitor? We've got complete directions below. German Park is about 6 miles south of South Lyon on Pontiac Trail. German Park is about 3 miles northeast of Ann Arbor. The easiest route is to take Huron Parkway north or Plymouth Road east to Nixon Road. Take Nixon Road north until it ends at Pontiac Trail. 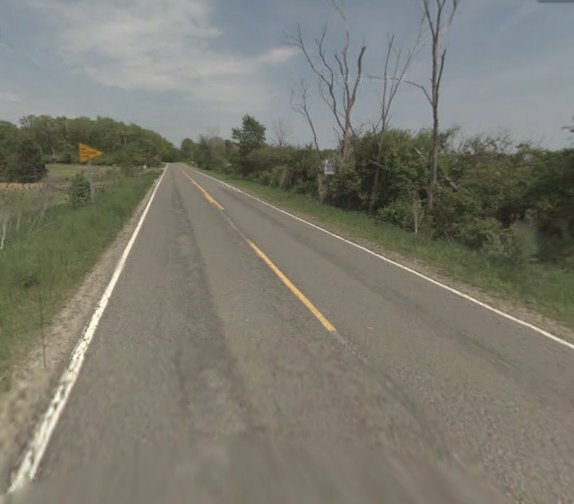 Take a right on Pontiac Trail towards South Lyon, and continue for about one mile. Going back to Ann Arbor is easier: Take Pontiac Trail all the way until it ends at the Broadway bridge. If you take a right over the bridge, that street takes you directly to downtown Ann Arbor. Take M-14 West to Ann Arbor. When coming from Detroit, stay on I-96 after the I-275 interchange. Exit at Gottfredson Road and head north to North Territorial Road. Go left and take North Territorial west until Pontiac Trail. Take a left on Pontiac Trail and proceed 1/2 mile. Take US-23 South to Ann Arbor. Exit at North Territorial Road, take a left, and head east to Pontiac Trail. Go right on Pontiac Trail and proceed 1/2 mile. Take I-94 West to Ann Arbor. Just before Ann Arbor, stay left and proceed on M-14. Take the second exit, Barton Drive, and turn left towards Ann Arbor. 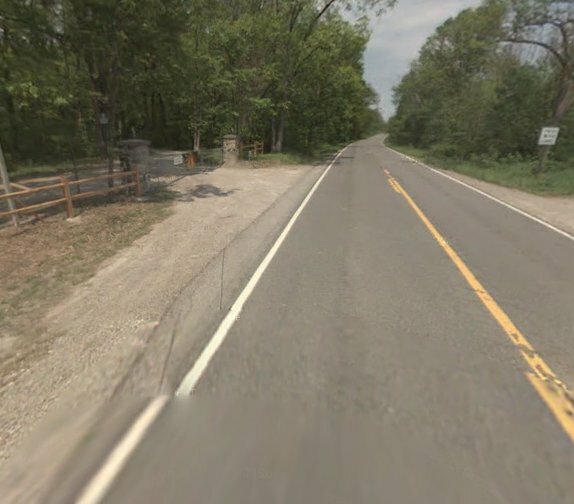 After 1/4 mile, at the intersection of Pontiac Trail, turn left again towards South Lyon. Continue about 2 miles to German Park. Take US-23 North towards Ann Arbor. The second Ann Arbor exit is Geddes Road. Turn right on Geddes Road. Just past the interchange is the intersection of Geddes and Dixboro Road. 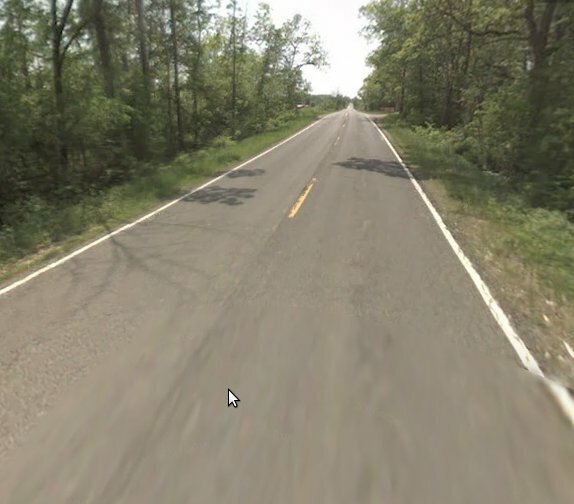 Take a left on Dixboro Road and head north about 5 miles. At the Pontiac Trail intersection, turn left, and proceed about 1/2 mile. German Park provides free parking for our guests. During our busiest hours, between 4pm and 7pm, we may be trying to park many cars at once using several crews of volunteers. Please follow the guidelines below for safety and efficiency. First time visitors should look for a German Park greeter standing in front of the entrance with a red, yellow, or black flag. Keep an eye out for him, slow down, and be prepared to turn into the parking lot. The original parking lot is directly in front of the ticket house. Early visitors who arrive before 5pm will be directed to park in this lot. Our big parking lot is about 100 yards west of park. This parking lot opens between 5 and 5:30 when we close the main entrance. Visitors coming from Ann Arbor need to be careful not to pass the entrance where the greeter is standing. When the main entrance is closed, it's a long drive to turn around. After pulling into the big parking lot, proceed down the driveway. At the end of the driveway, greeters will be able to answer questions and direct you to a parking spot. Please do not block traffic by stopping on Pontiac Trail or anywhere along the driveway. In particular, do not stop and unload passengers. Doing so creates a traffic and safety hazard. 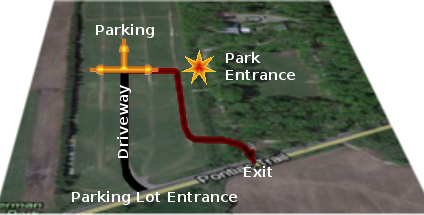 Please inform greeters at the end of the driveway and drop off passengers at the Park Entrance shown on the map. Then proceed down the roadway shown in red to the park exit. Drivers must exit the park after dropping off passengers. Please inform greeters at the end of the driveway if you need handicapped services. If handicapped parking is available, greeters will guide you there. Otherwise, they will make arrangements for shuttle transportation to the gate. Drivers are prohibited from using cell phones, texting, or other distractions. Drivers should have their windows rolled down in order to hear instructions from parking lot workers. Park only where directed. Otherwise, you will be asked to move your car or leave German Park. Parking lot speed is 15 mph. Families should stay together. There is a lot of traffic in our parking lots and children should be under control at all times. Tailgating is prohibited at German Park. German Park picnics are hosted on the last Saturday of the month in June, July, and August.